My personal list of favorite apps to study Chinese from 2013 has become one of the best-read articles on this website. Some of the apps on the list have disappeared, and many new apps have come – high time for a top 10 apps for studying Chinese 2015 update, with my favorites for Android, iPhone or iPad, from beginners to advanced levels of Mandarin. Find this interesting? Then you will also like my review of the funniest and most useful Chinese apps: Top 10 of Chinese Apps (iPhone/Android) 2015. Price: free (elementary), US $29.95 for Android (basic package), US $39.95 for iOS (basic package), US $99.99 (professional package) + optional add-ons. – Great range of dictionaries and easy handwriting recognizer. – Option to add individual add-ons, like the optical character recognizer that will help you read offline texts. – Train your Chinese vocabulary through flash cards: add any words you do not know to a category (for example: My Chinese Business Vocabulary, or Dirty Words in Chinese), and then quiz yourself through Pleco’s ‘test’ function. It will repeat all the words you got wrong until you have a 100% score. – The document reader (also included in the basic package) allows you to open any document in Chinese, either from your clipboard or via a URL, and read it with the help of the dictionary. You can tap the characters you don’t know and Pleco will translate it for you. 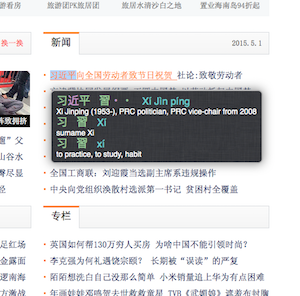 The so-called ‘web reader’ is my favorite feature because it makes reading Chinese newspaper articles so much easier. Pleco’s built-in webreader (used in iPad). – Perhaps the most important thing: Pleco has excellent service. If you have any problems with your software, you can contact the helpdesk and they will get back to you within 24 hours. If you have any problems transferring your previously bought version of Pleco to a new device, they will help you. – Once you have bought Pleco, there is no catch. It is reliable and you can continue using it for years & years. So are there no downsides to Pleco? Well, maybe just one. You can use the Pleco on three devices once you purchased it, but if you have both an iPad and a Android phone, then you cannot use one version of Pleco on both of them. So if you want to use Pleco on multiple devices, make sure they are all either Android or iOS based. Whether you are a beginner or an advanced learner of Chinese, listening is always a good way to learn new words, and get used to the language. 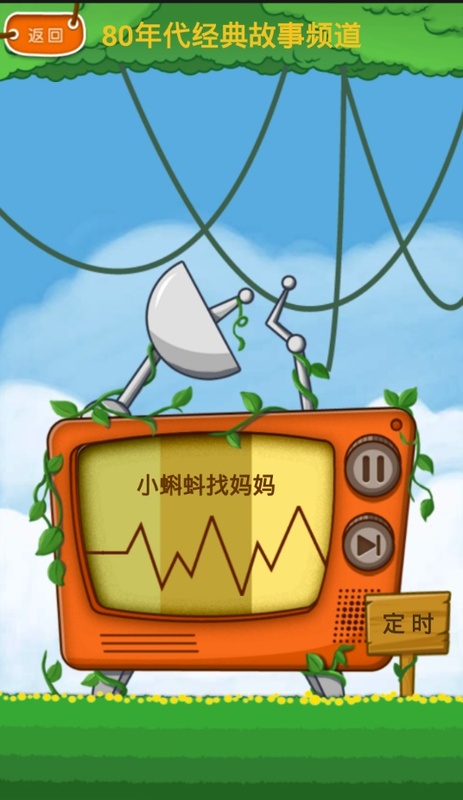 Dragonfly or Qingting FM (蜻蜓FM) is a top-ranking radio app that offers hundreds of channels from across China, from national to local levels. The app lets users choose from its most popular channels or by category: music, news, audiobooks, comedy, entertainment, opera, etc. This is a perfect app for anyone who wants to practice their Chinese or just discover China’s most popular music. 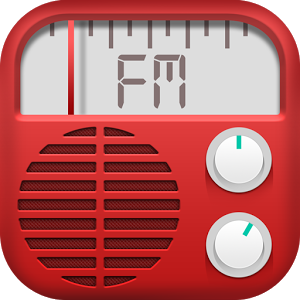 What is also great about it: you can listen to different radio stations across the country, this will is a good way to discover differences in speaking between, for example, Beijing and Shanghai radio. One obstacle if you are a beginner: the app is only available in Chinese. If you are not good at reading characters (yet), just tap on any station and start listening. Link directly to the app here. Recognizing and pronouncing tones in the right way is essential in your everyday use of Mandarin. Understanding or saying the wrong tones can lead up to awkward situations (speaking from experience, unfortunately). That is why this Laokang Tone Test is a must-have app if you are at the early stages of your study in Chinese. The app is very simple and basic: it will train both your hearing of tones, and your pronunciation. The lay-out of the app is not very pretty, but it works like a charm. Kids Mandarin is designed for kids from 3 to 9 years old. The app helps kids learn Chinese 9Mandarin) through intereactive flashcards and matching games in diverse topics, such as colors or animals. The app works with spoken pronunciation, pinyin, characters and images – making it a lively experience. The first three topics are free, it is 0.99$ to unlock the other topics. Although it is designed for kids, it is good for any beginner in Mandarin as the pronunciation and tones are very clear. And hey, you will have to know all the body parts or colors eventually anyway. (PS: the Kids Mandarin offered on Android is not the same as this one). Memrise offers courses in over 200 languages, and Mandarin is one of them. 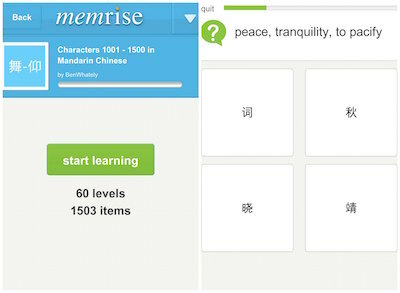 Memrise offers different free courses, from introductory Chinese up to 2000 Chinese characters. The app is all about testing and repeating – the same word is repeated over and over until you really know it. This is great for Chinese, because you get to see the pinyin, hear the pronunciation and see the character. In this way, you will soon remember a character’s meaning, tone and pinyin. Memrise also gives you points, so learning Chinese becomes more like a game in this way. Ok, ok, this is not really an app – but it needs to be in this list. Pera Pera is a pop-up dictionary add-on for Chrome or Firefox. It gives the English definition for Chinese texts, making it infinitively easier for those struggling with characters to read Chinese online. Pro’s: easy to install, easy to use, and translations for many modern names or slang words. Downside: if you use Pera Pera too often, you won’t actually learn the characters. Try to only activate this add-on when you really do not know the character. This is a basic Mandarin app that is still in the top charts of learning basic Mandarin, and it is most suitable for traveling or getting acquainted with Chinese. The free version provides basic expressions and sentences for situations such as introducing yourself, general conversation, transportation etc. The pro version includes more situations: hospital, dating, tourist attractions etc. 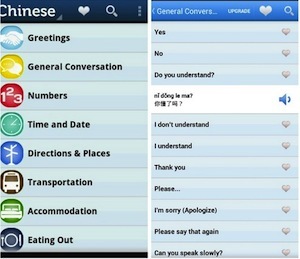 The app is clear and has everything you need from a basic phrasebook. It provides the pinyin with tones, the characters, and you can click on any sentence to hear its pronunciation. Ready for your first HSK (Chinese Proficiency) test? Dr. HSK helps you prepare for level one with a word bank, practice tests and mock tests. The first test is free, for test 2 & 3 you need to spend 0.99$ per test. The best part of this app is the listening part. If your listening is not too good yet, this is a good way to prepare for what will be asked of you in HSK level 1. 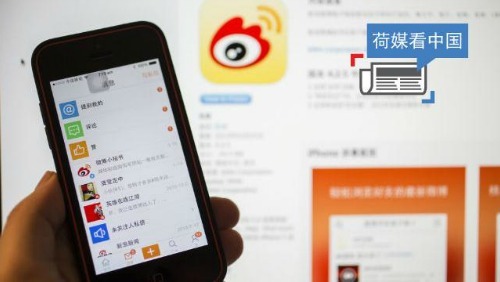 I ended the 2013 list with this app, and will end with it now too: Sina News. 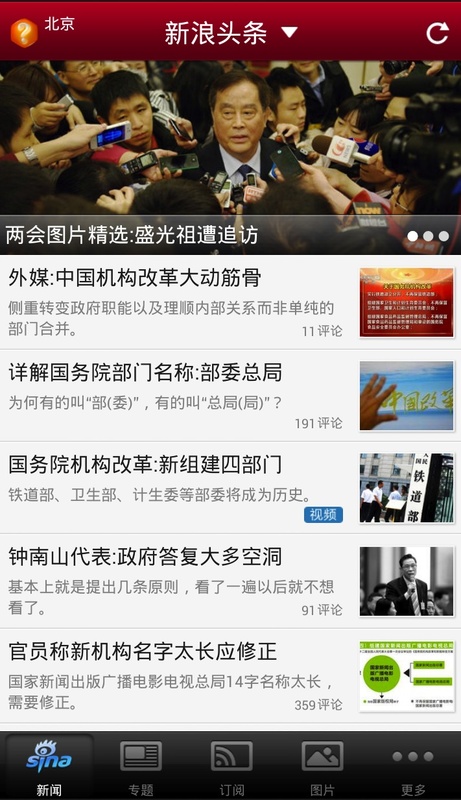 This app gives a clear overview of China’s current headlines and is therefore arguably the best Chinese app on China’s news around. 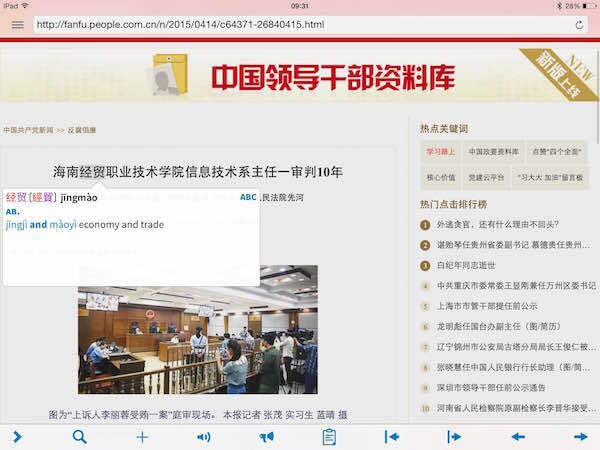 Reading the news in Chinese might be something for advanced learners, but you could also download this app when it’s still a bit difficult to read for you- especially if you have the Pleco dictionary installed, that has the web reader. Just tap on an article, copy the text go to your Pleco Reader, or copy the URL and read the article straight from the Pleco app. Then you can tap on all the words and characters you do not know and it will be translated right away. Thank you very much for the lovely review of Pleco! Thanks for these suggestions Manya. I definitely need to try out Laokang! Other apps I would also recommend are Chinesepod, Anki (loads your own vocan lists), Hanping dictionary (don’t know how it compares to Pleco) and the excellent Skritter (writing). Any suggestions for reading material at HSK2/Elementary-Intermediate level? You find the app ‘Decipher Chinese’ on iphone or android useful. The app is a news feed written for adult learners at mostly HSK2 and HSK3, but sometimes HSK1 level in simplified Chinese. The articles are short and updated regularly. This is a great list of the top 10 apps for studying Chinese in 2015. However, its now 2017 and the landscape has changed a bit! 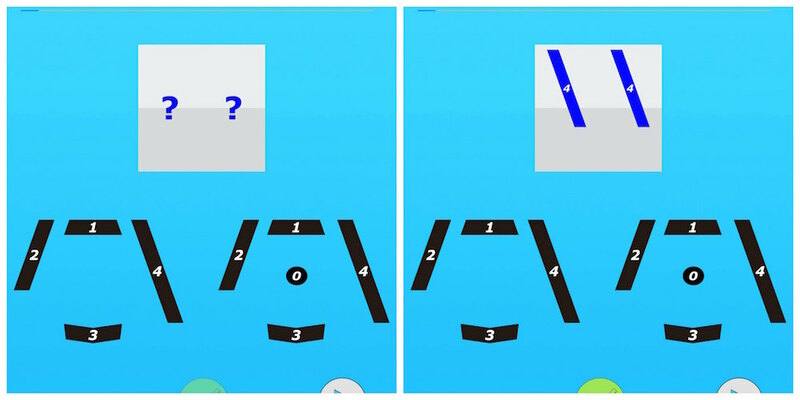 In fact, we’ve got a brand new app for learning Chinese called TutorMandarin, https://play.google.com/store/apps/details?id=inc.osbay.android.tutormandarin. Would love to have it consider for your next top 10 list! How / where do you need to go to safely download BBTT for android?